Do not use diesel to refuel vehicles with a gasoline engine. Do not switch on the ignition if you accidentally refuel with the wrong fuel. Otherwise, the fuel will enter the fuel system. Even small amounts of the wrong fuel could result in damage to the fuel system and the engine. Notify a qualified specialist workshop and have the fuel tank and fuel lines drained completely. Only refuel using unleaded gasoline with a minimum octane rating of 91. Only use the fuel recommended. Operating the vehicle with other fuels can lead to engine failure. Do not mix such fuels with the fuel recommended for your vehicle. Do not use additives. This can otherwise lead to engine damage. This does not include cleaning additives for the removal and prevention of residue build-up. gasoline may only be mixed with cleaning additives recommended by Mercedes-Benz; see "Additives". You can obtain further information from any authorized Mercedes- Benz Center. To ensure the longevity and full performance of the engine, only premiumgrade unleaded gasoline must be used. • only fill the fuel tank to half full with regular unleaded gasoline and fill the rest with premium-grade unleaded gasoline as soon as possible. • do not drive at the maximum speed. • avoid sudden acceleration and engine speeds above 3000 rpm. • never refuel using fuel with an octane number lower than 87. Otherwise, engine failure could occur. Using mixtures of methanol and ethanol is not permitted. E10 fuel or E15 fuel (unleaded gasoline with 10% or 15% ethanol) can be used. For further information, consult a qualified specialist workshop or on the Internet at http://www.mbusa.com (USA only). Operating the engine with fuel additives added later can lead to engine failure. Do not mix fuel additives with fuel. This does not include additives for the removal and prevention of residue buildup. gasoline must only be mixed with additives recommended by Mercedes-Benz. Comply with the instructions for use on the product label. More information about recommended additives can be obtained from any authorized Mercedes-Benz Center. The quality of the fuel available in some countries may not be sufficient. Residue could build up as a result. In such cases, and in consultation with an authorized Mercedes- Benz Center, the gasoline may be mixed with the cleaning additive recommended by Mercedes-Benz (part no. A000989254512). You must observe the notes and mixing ratios specified on the container. If you mix diesel fuel with gasoline, the flash point is lower than that of pure diesel fuel. Only use commercially available vehicular ULTRA-LOW SULFUR DIESEL FUEL (ULSD, 15 ppm maximum sulfur content) that meets the ASTM D975 standard. If you do not refuel with ULSD, you may damage the BlueTEC exhaust gas aftertreatment system of the vehicle. Do not use gasoline to refuel vehicles with a diesel engine. Do not mix diesel fuel with gasoline, kerosene or paraffin. This may otherwise result in damage to the fuel system and engine. 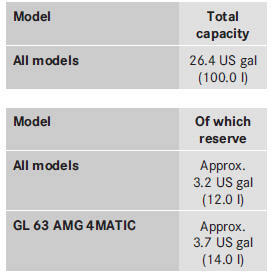 Mercedes-Benz USA approves the use of biodiesel B5 for all BlueTEC diesel engines. The concentration of bio-diesel in the ULSD may not exceed 5% by volume. Pure bio-diesel and diesel fuel with a higher percentage of bio-diesel, such as B20, can damage the engine and the fuel system. For this reason, they are not approved. For more information, consult the gas station staff. The bio-diesel B5 label on the gasoline pump must clearly state that the standard for ULSD has been fulfilled. If the label is not clear, do not refuel the vehicle. Diesel fuel with improved cold flow properties is available during the winter months. Further information about fuel properties can be obtained from oil companies, e.g. at gas stations. To improve the low-temperature resistance of diesel fuel, a flow improver can be attached. The effectiveness of a flow improver is not guaranteed for every fuel. Only use flow improvers tested and approved by Mercedes-Benz. During use, please observe the information on operation. Correct dosage and sufficient mixing are decisive in improving low-temperature resistance with the flow improver. Overdosage can potentially even decrease low-temperature resistance and must therefore be avoided. Follow the manufacturer's guidelines on dosage. Mix the additive into the diesel in good time, before the flow characteristics of the diesel become insufficient. Otherwise, malfunctions can arise through heating the fuel system, e.g. through parking in a heated garage. More information about recommended flow improvers can be obtained from any qualified specialist workshop.